While CrossFit workouts and Triathlons push your body to the limit, golf is a sport that can be played regardless of your fitness level or age. If you can walk, you can likely still enjoy a round of golf. While putting and chipping may not translate to many health benefits, walking a golf course, particularly if you play 18 holes, is an excellent way to stay fit. To help you achieve this end, consider a regular exercise program 3-5 days a week encompassing cardio and core exercises. Did you know that a solid core gives you both power and protection from injury when you hit the links? If you’re tempted to rent a golf cart, consider walking instead. Research shows that after one season of weekly golf games that involved walking the course, males over 50 significantly decreased their cholesterol count. 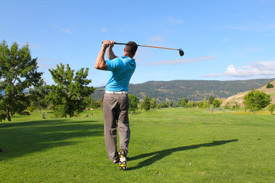 Whether you consider yourself a weekend duffer or a serious golf enthusiast, you can steady your swing with chiropractic. A solid base is important for a stable swing. If you have flat or sore feet, consider custom-made orthotics to support and improve the base stance and help reduce fatigue through your legs, hips and back. Before you plan to tee off, give yourself some extra time before a game on the driving range and putting green. Doing so prepares you both mentally and physically. Some stretching before your game is also important but don’t overburden yourself with pre-game stretching. A few dynamic vs. static stretches are key. Basic shoulder rolls, lunges, side bends and some gentle twists are all that are needed. Before you relax at the 19th hole, consider some good stretches after a game as well. At this time, static stretches serve you better. There are many websites offering stretching suggestions. Simply google “golf warm-up routines” or “golf exercises” and you’ll see what I mean. Downloading a chart or an easy-to-follow guide from one of the sites may be helpful. I like this one from www.northlakesgolfclub.com.au/blog/dynamic-golf-warm-ups. Want to power up your swing? Banish back pain so you can return to the fairway? If you’d like to optimize athletic performance or get back on your game if injury poses a barrier, chiropractic care and massage therapy are excellent options. Contact us with any specific concerns regarding your ability to play golf or any sport safely, particularly when experiencing back or other physical issues. We have lots of experience with athletes in our area. You don’t have to rack up birdies, eagles and holes in one to enjoy the game of golf. Relish the walk in the park and don’t take yourself too seriously!